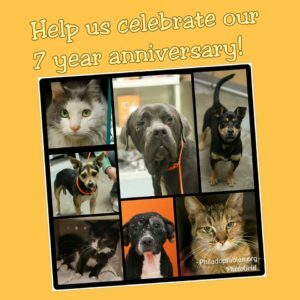 February 9, 2018 was our 7 year anniversary as a non-profit. In celebration, we decided to give donations to 7 local rescues. We asked the public to share their rescue stories to help in our decision making and the response was overwhelming! We laughed and we cried while reading these stories. From hurt and homeless to happy and loved, these dogs, cats, horses, and other creatures are alive due to the dedication of these amazing rescues. The Philly area rescue community is a strong one! This was such a difficult decision that we decided to contribute to 13 rescues instead!